The large orb around the moon that shines bright above this castle in Hungary is a celestrial phenomenon known as a moon halo. The spectacular image was taken by skywatcher Tamas Ladanyi of the World at Night (TWAN) in Veszprem on Feb. 2. "It was dramaitic view at -6 degree ambient temperature," Ladanyi wrote in an email. Multiple exposures are required to create enough light for the shot. 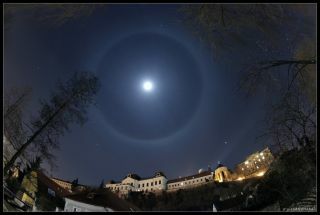 Ladanyi's moon halo is the one of the most visible such phenomenon throughout the world. They are often seen when cirrus clouds streak through the sky. The bright star Sirius, constellation Orion, star clusters Hyades and Pleiades, constellation Auriga and planet Jupiter are also visible in the image. This large halo was caused when light is diffracted from ice crystals in the sky. Since the crystals are all of the same general shape, the light bouncing off them creates the circular pattern. One can see a faint red tinge on the inner orb of the halo, which fades on the outer edge. Darker areas inside the halo indicate the absence of light from the crystals. In addition to moon halos, bright moonlight can even create moonbows, rainbow-like apparations that appear at night. In California's Yosemite National Park, photographers flock to the park's many waterfalls to snap photos of stunning moonbows.